An industrial fan can make almost any workspace feel significantly safer and more comfortable. However, to keep an industrial fan working properly, you may need to make certain repairs to it. Check out some of the most common industrial fan repairs below. An industrial fan is making too much noise. Does your industrial fan make entirely too much noise when you turn it on? There are a number of things that can cause this. In some cases, the impeller on your fan might not be centered. In others, you might have an impeller that is either crooked or damaged. You could also have a loose shaft or a shaft that is bent. A professional can take a look at your impeller to see what’s causing it to make so much noise and fix it. An industrial fan isn’t turning on. A noisy industrial fan might be annoying, but at least you’ll know it’s turning on and trying! There are other instances in which an industrial fan won’t turn on at all. This could be caused by an electrical issue with the fan. However, it might also be caused by a blown fuse, a loose pulley, a broken belt, or something else entirely. 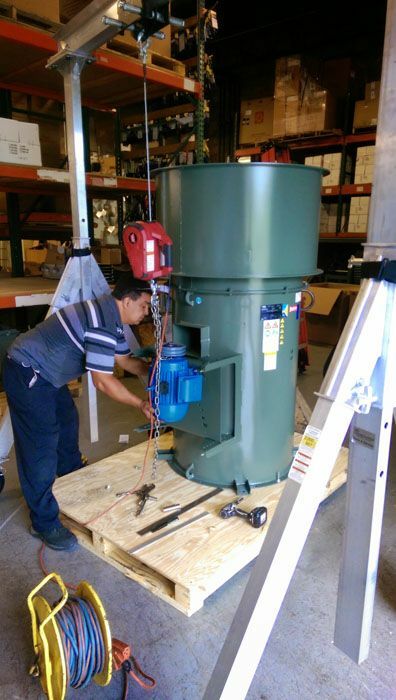 A company that specializes in fixing industrial fans will be able to diagnose the problem and fix it in no time. An industrial fan isn’t removing heat, dust, fumes, and more from your facility. Is your industrial fan turning on but not doing the job it’s supposed to be doing? The impeller in your fan might be installed backwards. Your blade angle setting could also be off. You could even have something as simple as a clogged inlet that’s stopping air from flowing cleanly through your fan. Whatever the case, you’ll want to have your industrial fan repaired to ensure it’s able to get your facility back to being safe and comfortable again. Do you need to have your current industrial fan serviced or repaired? Dynamic Fan can assist you with all your industrial fan repair needs. Call us at 973-244-2422 today to set up an appointment. ← What is a Centrifugal Fan Used For?